Set ingredients into cocktail shaker with ice and shake well so that you end up with a some ice crystals. 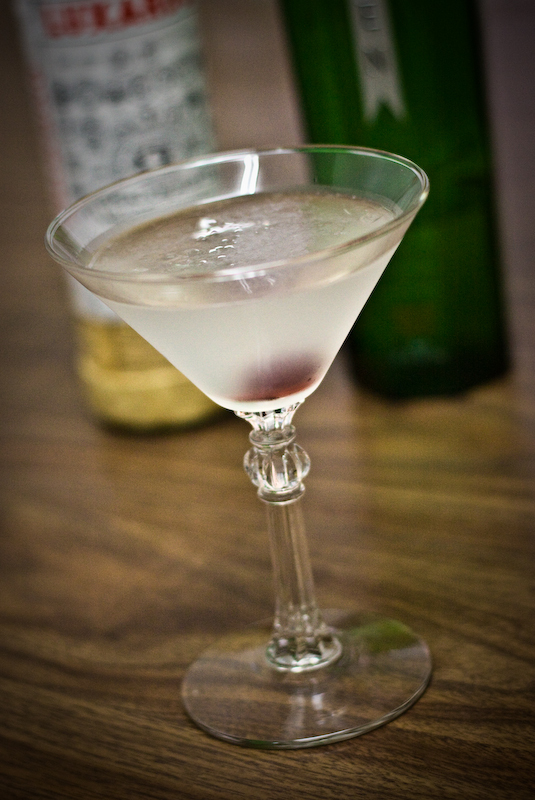 Double strain (you will want to filter any lemon pulp) into Martini glass and garnish with a single griottine cherry. The recipe calls for Crème de Violette is quite difficult to locate. Legacy Liquor store in Olympic Village might carry it. Personally I didn’t include it in the drink I made above because I don’t have it. I have tried the drink at West Restaurant on Granville St. and it’s quite tasty. Without the Creme de Violette, I feel that it’s just not as well balanced and makes the drink taste slightly more sour than it should be. Also FYI, Crème de Yvette is not a substitute for the Violette.